CuteCircuit, the company behind the Hug Shirt and conceptual mobile phone dress, is at it again with a programmable t-shirt. 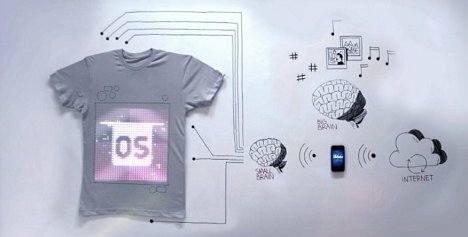 TshirtOS is a wearable system that lets you decide from one minute to the next what will be displayed on your chest. It’s controlled by your smartphone and you can change up the display as many times as you please. There are so many possibilities for what could be shown on the shirt’s large screen, from your Twitter feed to vacation photos to your favorite YouTube videos. According to CuteCircuit, the shirt is machine washable – you just have to remove its battery first. There isn’t a lot of information on the shirt’s eventual price, but we’re guessing money will be no object to the people who can’t wait to display their digital lives to unsuspecting bystanders. See more in Home & Personal or under Gadgets. September, 2012.